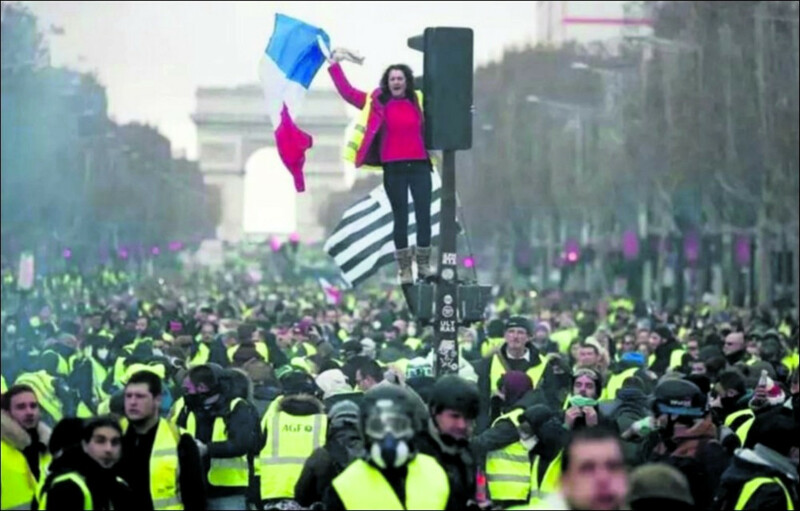 We translate into Spanish the call for an unlimited general strike, convened by François Boulo from Rouen for the Yellow Vests, the grassroots movement that has defied the brutal repression of the Emmanuel Macron regime and continues to mobilize around demands on health, employment, education and housing. 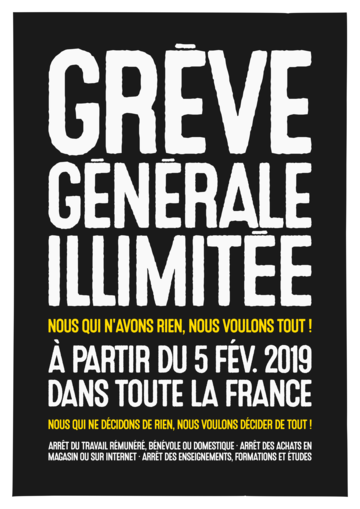 We appeal to all French citizens: salaried workers, seasonal workers, civil servants, craftsmen, merchants, businessmen, farmers, the unemployed, pensioners, professionals, students, schoolchildren, artists, intellectuals to be mobilized to build as of February 5, 2019, the unlimited general strike. At this moment, we regret to see that the executive power persists in not listening to any of the demands presented by the Yellow Vests and in implementing an unjust policy rejected by 75% of the population of France. It is quite clear that the Great National Debate is nothing more than a communication strategy, which aims to anesthetize public opinion without any concrete action being taken for change. The president of the republic has categorically refused to reevaluate the fiscal measures that were imposed at the beginning of his term that benefit the 1% of the richest …. It has also confirmed its reduction of essential public expenditures: health, education, police and justice. Instead of listening and trying to calm the people, what the president of the republic and his government have done is put gasoline on the fire with his irresponsible statements: “crowd with hate”, “agitators”, people who “lack a sense of effort”. 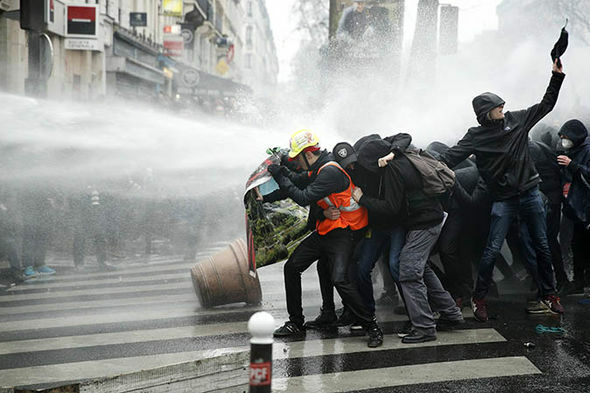 This chaotic strategy has resulted in 1000 injuries among our police and gendarmes; 12 dead and 1800 injured among the demonstrators, of which a hundred have been mutilated, disfigured or blinded. Not a word of empathy with the victims has been uttered by the institutional spokespersons. The violence that shakes our nation must stop and our demands must be met. 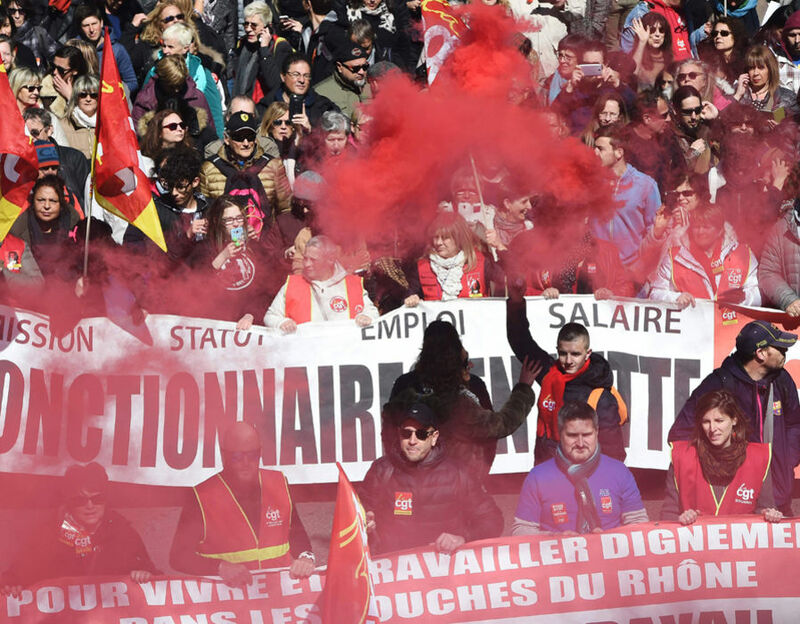 As a result, we appeal to the whole of French citizenship: salaried employees, seasonal workers, civil servants, craftsmen, merchants, businessmen, farmers, the unemployed, pensioners, professionals, students, schoolchildren, artists, intellectuals to be mobilized to build as of February 5. of 2019, the unlimited general strike. 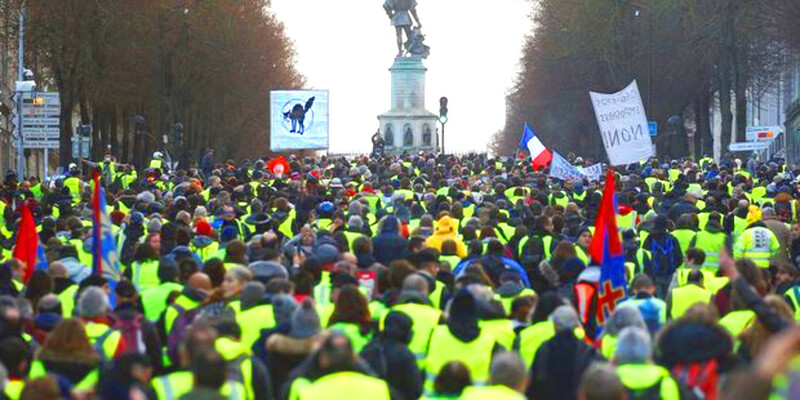 We call on the Yellow Vests as a whole and all those who want to join us to spread this call through all social networks and in the field, factories, universities, high schools, public establishments. We also call all citizens to implement a boycott of large shopping centers and instead opt for local commerce, in order to support them in these times of crisis. This is the moment in which each one must ask himself in the depth of his being, if he should continue supporting a power that has lost its legitimacy and that, abandoning the sense of the general good, has lost the essence of his mandate. Or if, on the contrary, it is time to finally recover our common destiny. This is the sacrifice that the time demands of us to ensure the future of our children and grandchildren. It is a moment that is and must be historical. 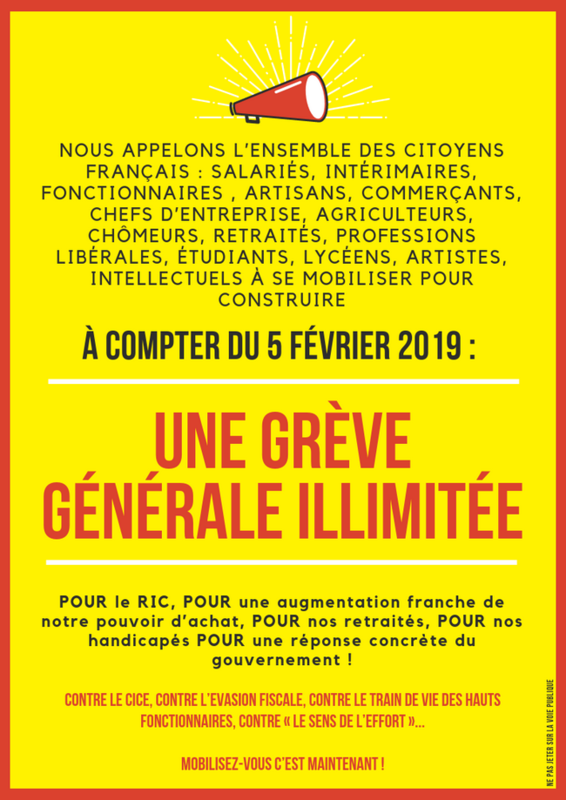 Leaflet issued by Public service sector, Confédération Generale du Travail, CGT, French trades union confederation, Wednesday 19 January 2019. 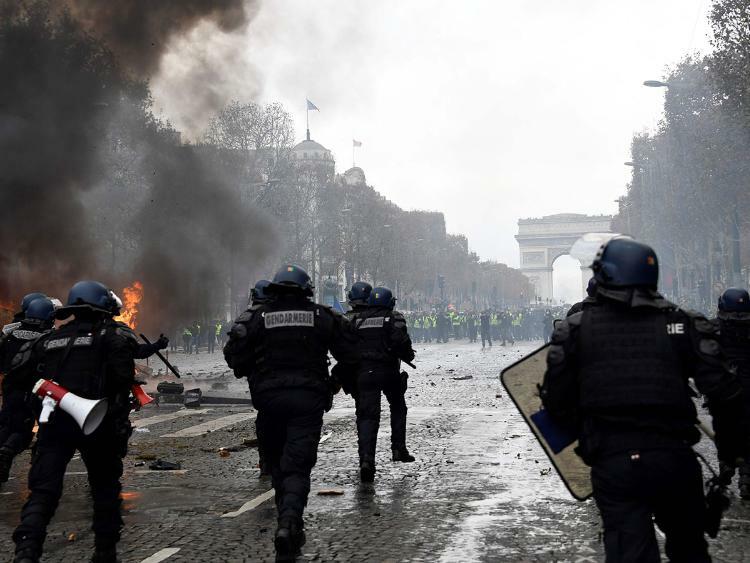 Faced with long months of mobilisation and the unprecedented yellow vests movement, Emmanuel Macron has been forced to make concessions, although obviously not enough. Him – the man who said he would never back down. For all that, the essence of his policies – gifts to the bosses and the wealthiest, and smash up public services – continues to be put into effect. Make no mistake about it, the Great National Debate is above all a smokescreen operation, since the existing political authorities have already said that, on the majority of important points, they are not going to re-examine their approach. The perfect example of this refusal to put any of their liberal aims up for discussion is given by the government’s treatment of public services. Indeed, while state reform is explicitly on the menu for the “Great Debate”, ministers in charge of public services have just confirmed, in particular, that the devastating parliamentary bill, more or less already worded, retained all its current force and that its adoption by Parliament is expected in June. Remember that this text provides for increased and massive recourse to non-tenured workers, the dismantling of consultative bodies, the individualisation of pay, and for arrangements to accompany and facilitate the abandonment of public remits and the closure of services. It certainly represents an unprecedented attack on the whole legal edifice of public service. These serious threats are added to the freezing of the value of the index point (and there is every sign that the government wants to keep this until 2022! ), the re-establishment of the jour de carence[i], more job losses, etc. That is to say: the situation is beyond worrying. But those who rule us are far from winning. Citizens are very attached to their public services, discontent is everywhere growing louder and there are more and more mobilisations. The first responsibility of trade union organisations is to show alternative ways, make them popular and organise the response at the workplace. This is what CGT will do across all sectors on Monday 5 February. On that day it will call on all wage earners in both the public and the private sector to mobilise, demonstrate and stop work. Absolutely everything makes it essential that public service workers, whether local, Health Service of State employees, join up in the greatest possible numbers in these times of powerful struggle and convergence. ü Creation of jobs with proper tenure wherever they are needed. ü Job security for workers on short-term contracts. Down with casualisation! ü Repeal of the jour de carence. ü A considerable improvement in the benefits of schemes already paid in. CGT Public Services calls on public service workers to demonstrate and strike on 5 February. 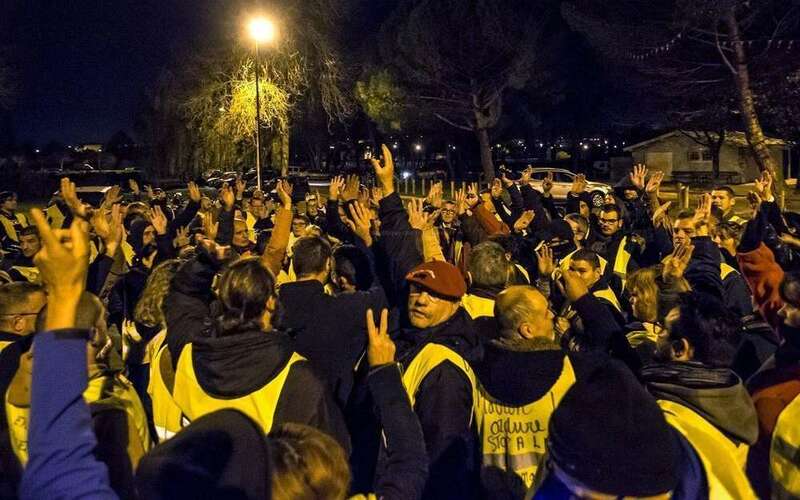 The Gilets Jaunes of Commercy recently organized an “Assembly of Assemblies” to coordinate the radical democratization of the popular resistance in France. 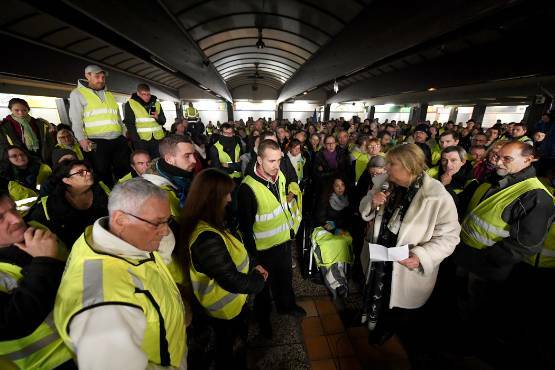 We, Gilets Jaunes of the roundabouts, parking lots, squares, assemblies and demonstrations, gathered on January 26 and 27 for an “Assembly of Assemblies”, which united members of over a hundred Gilets Jaunes delegations from across France, all answering the call of the Gilets Jaunes of Commercy. Since November 17, 2018, from the smallest villages deep in the country side to the biggest cities of France, we rose up against this deeply violent, unjust and unbearable society. We shall no longer be treated that way! We revolt against the cost of life, poverty, instability and misery. We wish for our relatives, friends, families and children, that they all will be able to live in dignity. Currently, 26 billionaires possess as much as half of the world population — this is totally unacceptable. Let’s share wealth and not misery! Down with the social inequalities! We demand the immediate increase of wages, of the social allowances, of the subsidies and pensions; we demand the unconditional right for lodging, health, education and free public services for all! It is for all these rights that we occupy the roundabouts across the country on a daily basis, that we organize direct actions, demonstrations and arrange public debates. 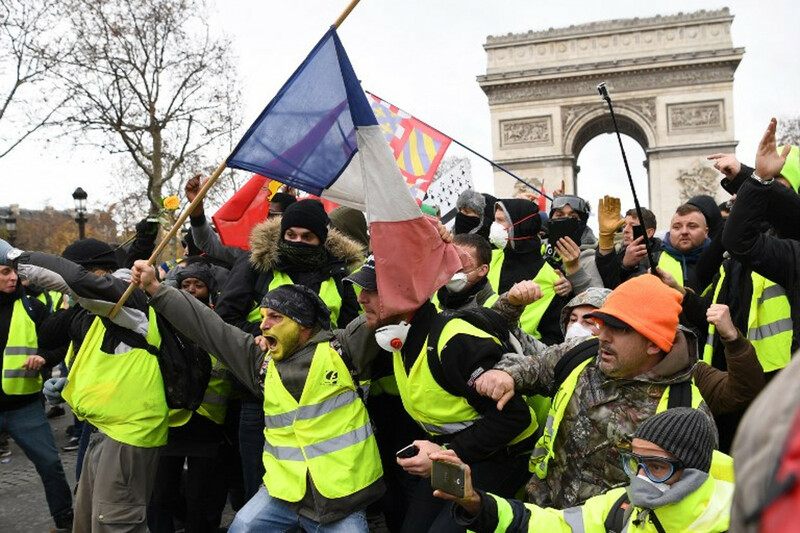 With our yellow vests, we are reclaiming the power to speak, we who never had it before. And then, what is the response from the government? Repression, hubris, denial. Deaths, thousands of wounded, the massive use of weapons designed to maim, blind, injure and traumatize. Over 1.000 persons have been arbitrarily arrested, sentenced and jailed. 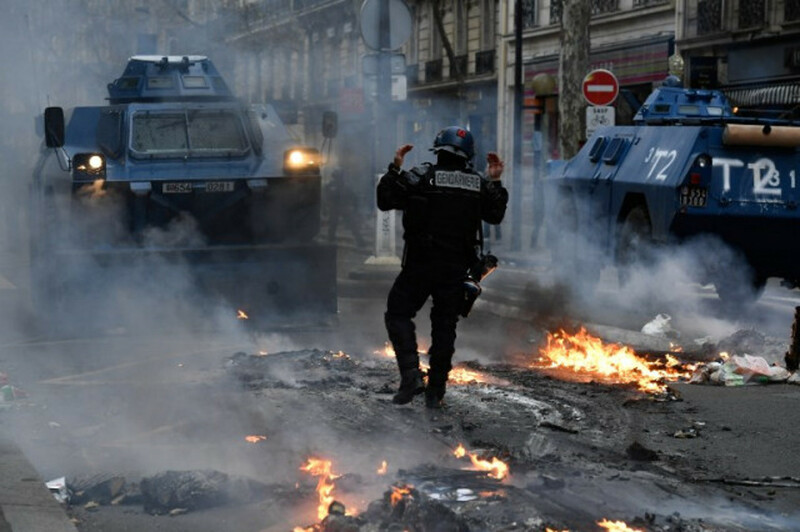 Now a new, so-called “anti-arson law”, is designed to deny us the right of demonstration. We condemn all violence against the demonstrators, be it from the police forces or from violent groups. None of this will stop us! 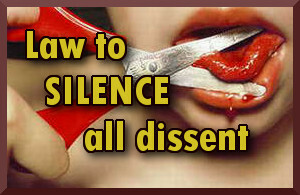 To manifest one’s discontent is a fundamental right. Down with the impunity of the police forces! Amnesty for all the victims of the repression! And what a sham is this idea of “Grand National Debate”. It is just a one big publicity stunt and PR campaign by the government, using and hijacking our will to debate and decide for ourselves! The true democracy is practiced within our popular and public assemblies and on the roundabouts. It is not on the stage of television sets nor is it in the so-called political round-table organized by Macron. After insulting us and treating us like we are nothing more than scum, they are now presenting us as a heinous, racist and fascist crowd. But we are the total opposite: neither racist nor sexist nor homophobic, we are simply proud to be together with all our differences to build a society in solidarity. We are as strong as the diversity of our debates. At this very moment, hundreds of assemblies are elaborating and proposing their own demands. These assemblies talk about real democracy, social justice, tax issues, working conditions, ecological justice and the end of discrimination. Among the most debated claims and strategical proposals we find: the end of misery in all its forms, the transformation of the institutions (with projects like the Citizen Initiated Referendum, constituent assembly, the end of the privileges of the elected representatives), the ecological transition (energetic scarcity, industrial pollution), equality and the recognition of anyone no matter what nationality (handicapped people, gender issues, an end to the isolation of the populous suburbs, neighborhoods, rural areas and overseas territories). We, Yellow Vests, are inviting anyone to join us with their own abilities and capacities. We call to pursue the actions with Act 12 against police violence in front of the police stations and the Acts 13, 14 etc… We call for the continuation of the occupation of the roundabouts and the blocking of the economy, to engage in a massive and unlimited strike starting on February 5, 2019. We call for the creation of popular committees in the workplaces, in study places and everywhere else in order that this strike could led from the grassroots by the strikers themselves, and not by the unions. Let’s take the matter in our own hands! Don’t stay alone, join us! 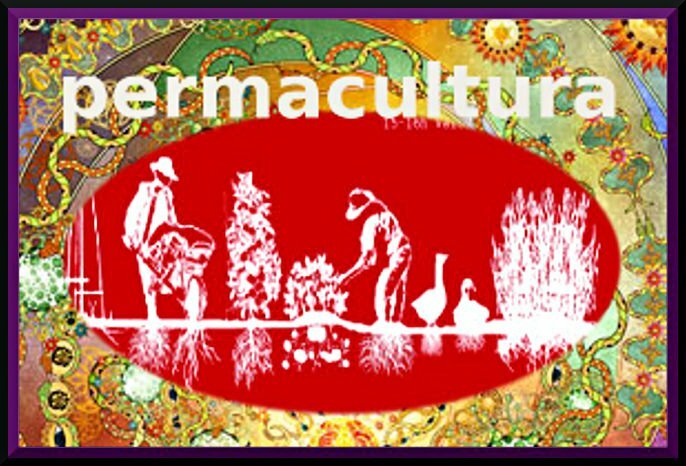 Let’s organize ourselves democratically, independently and autonomously! This assembly of assemblies is a very important milestone which allows us to discuss about our demands and our means of action. Let’s federate to transform the society! 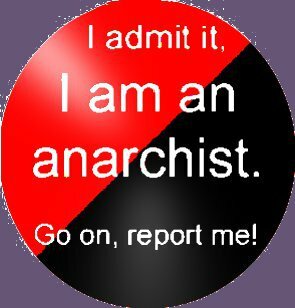 We propose that all the Yellow Vests circulate this call. And if, as a Gilets Jaunes group, it resonates with you, send your signature to Commercy at (assembleedesassemblees@gmail.com). Don’t hesitate to discuss and formulate some proposals for the next “Assembly of Assemblies” which we already are preparing. Macron Resign! Long live the power of the people, for the people and by the people. This call is proposed by the Assembly of Assemblies in Commercy. This call will then be proposed for approval in all local assemblies. This call was translated from French by Resistance 71. The original version in French can be found here. 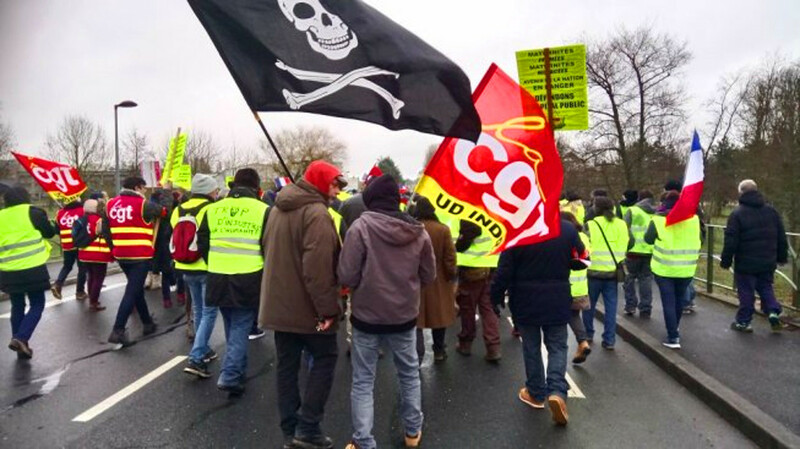 Traducimos al español el llamado a una huelga general ilimitada, convocada por François Boulo desde Rouen por los Chalecos Amarillos, el movimiento de base que ha desafiado la brutal represión del régimen de Emmanuel Macron y sigue movilizando en torno a reinvindicaciones sobre salud, empleo, educación y vivienda. Hacemos un llamado al conjunto de la ciudadanía francesa: Asalariados, temporeros, funcionarios, artesanos, comerciantes, empresarios, agricultores, parados, jubilados, profesionales, estudiantes, escolares, artistas, intelectuales a movilizarse para construir a partir del 5 de febrero de 2019, la huelga general ilimitada. En estos momentos, lamentamos ver que el poder ejecutivo se obstina en no escuchar ninguna de las reivindicaciones presentadas por los Chalecos Amarillos y a implementar una política injusta rechazada por el 75% de la población de Francia. Queda completamente claro que el Gran Debate Nacional no es más que una estrategia de comunicación, que persigue anestesiar a la opinión pública sin que se haya adoptado ninguna medida concreta para el cambio. El presidente de la república se ha negado categóricamente a reevaluar las medidas fiscales que se impusieron al iniciarse su mandato que benefician el 1% de los más ricos…. Igualmente ha confirmado su reducción de los sgasto públicos esenciales: La salud, la educación, la policía y la justicia. En vez de escuchar e intentar calmar al pueblo, lo que han hecho el presidente de la república y su gobierno es echarle gasolina al fuego con sus declaraciones irresponsables: “multitud con odio”, “agitadores”, gente que “carece de un sentido del esfuerzo”. Esta estrategia caótica ha resultado en 1000 heridos entre nuestros policías y gendarmes; 12 muertos y 1800 heridos entre los manifestantes, de los cuales una centena han sido mutilados, desfigurados o cegados. Ni una palabra de empatía con las víctimas ha sido pronunciada por los portavoces institucionales. La violencia que sacude nuestra nación debe parar y nuestras reivindicaciones deben cumplirse. Como consecuencia, hacemos un llamado al conjunto de la ciudadanía francesa: Asalariados, temporeros, funcionarios, artesanos, comerciantes, empresarios, agricultores, parados, jubilados, profesionales, estudiantes, escolares, artistas, intelectuales a movilizarse para construir a partir del 5 de febrero de 2019, la huelga general ilimitada. Hacemos un llamado a los Chalecos Amarillos en su conjunto y a todos y todas quienes se quieran unir a nosotros a difundir este llamado por todas las redes sociales y en el terreno, las fábricas, universidades, liceos, los establecimientos públicos. Llamamos igualmente a todos los ciudadanos a que implementen un boicot de los grandes centros comerciales y en vez opten por el comercio de proximidad, con el fin de apoyarlos en estos momentos de crisis. Este es el momento en que cada uno debe preguntarse en la profundidad de su ser, si debe seguir apoyando un poder que ha perdido su legitimidad y que, abandonando el sentido del bien general, ha perdido la esencia de su mandato. O si, por el contrario es momento de finalmente recuperar nuestro destino común. Este es el sacrificio que nos exige la época para asegurar el futuro de nuestros hijos y nietos. Es un momento que es y debe ser histórico. Es la hora que hacer respetar el Artículo 2 de nuestra constitución: el principio de una República y un Gobierno del Pueblo, por el Pueblo y para el Pueblo. 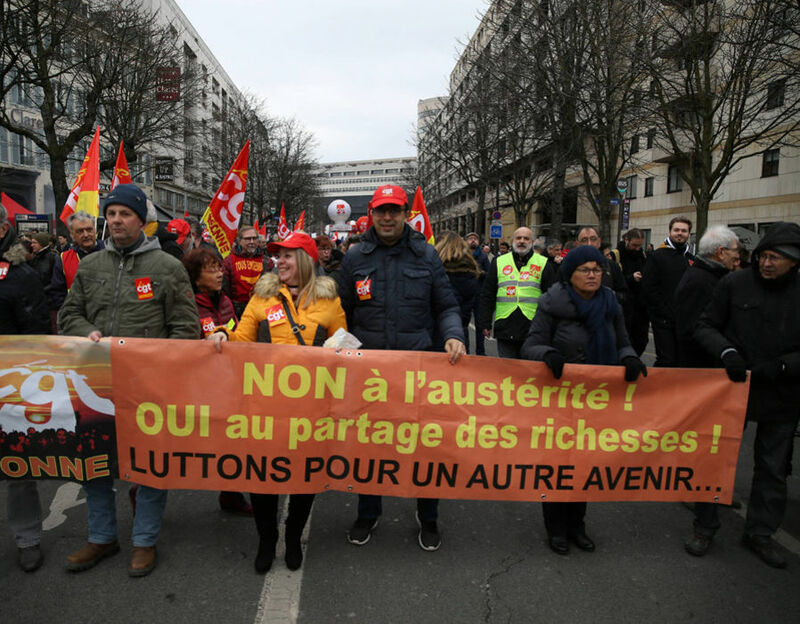 Les faits :Le syndicat CGT appelle l’ensemble des français «les salarié·e·s, les agent·e·s, les jeunes comme les retraité·e·s, les privé·e·s d’emploi» à faire grève et à manifester le mardi 5 février 2019.Etant donné que l’appel concerne tous les travailleur des secteurs privés et publics et qu’il est à l’échelle nationale, on peut considérer que c’est un appel à une grève générale et nationale.Le mouvement concerne «l’urgence sociale». 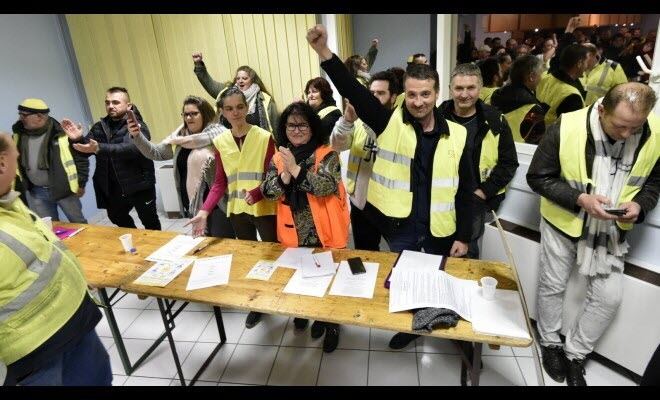 Plusieurs leaders des gilets jaunes, ainsi que certains partis politiques, ont appelé à se joindre aux manifestations. 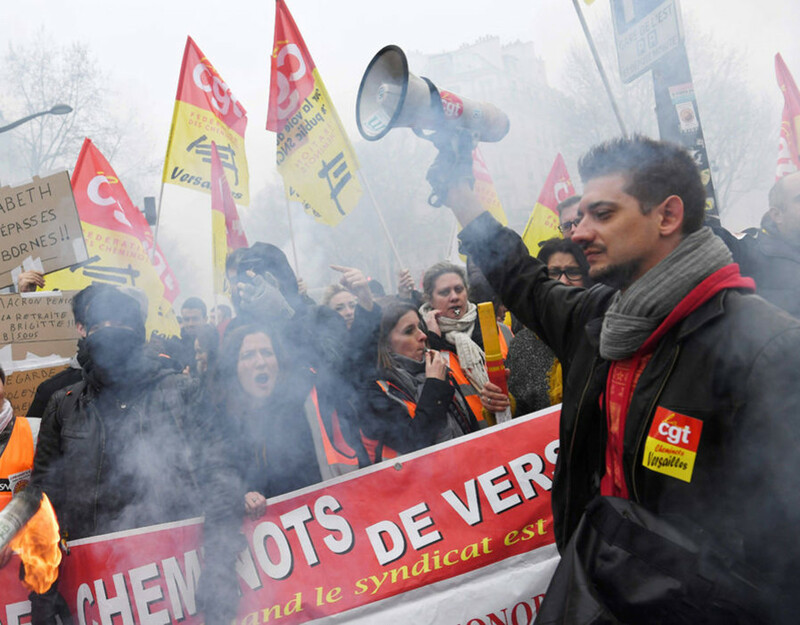 SNCF : la Fédération CGT des Cheminots a déposé un préavis de grève du lundi 4 février 20H au mercredi 6 février 7H55. Les prévisions de perturbations sur les trains seront diffusées par la SNCF probablement le 04/02 dans l’après midi. A ce moment-là, vous pourrez vérifier si votre ligne est impactée sur le site de la SNCF. Pour le moment, nous n’avons pas d’informations sur la participation du secteur de l’aérien, ni sur les villes dont les transports publics seront impactés. Ecoles : les syndicats d’enseignants tels que Sud Education et Snipp Fsu appellent leurs adhérents à se mobiliser. Contactez l’école de votre enfant pour connaitre les perturbations et savoir si l’accueil et la tenue des cours sont assurés. Collèges et lycées : l’organisation syndicale de l’enseignement du second degré (collèges et lycées) Snes FSU appellent à se joindre à cette journée de mobilisation. Rappel : même si préavis est déposé, chaque enseignant est libre de faire grève ou non. Il n’est pas certain que l’intégralité des cours soit annulée ou que l’établissement soit fermé. Convocatoria legalizada por CGT Francia AQUI enlace. 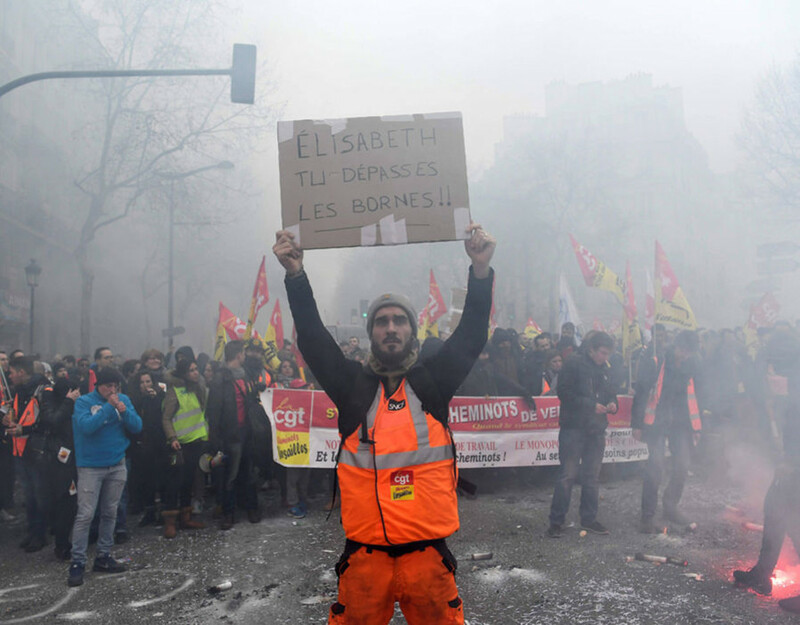 Yellow Vests call for general strike Feb 5.